The famous Twiggy reappears as Soffitto, a clever suspension version designed to hover above your table, rotate to where you need light most or move out of the way for standing room only occasions. The original Twiggy was created in 2006 by British Designer Mark Sadler. It continues to prove popular due to its innovative technology, materiality and unique patented design which cannot be replicated. Inspiration: A thin flexing arched line with movement reminiscent of a laden branch. Fabrication: A cylindrical shade with surface interest ‘dangles’ on the end of a diminishing and flexing rod suspended from a round matt black metal ceiling rose. Black liquid coated fibreglass finish. Light source 20WE27. Hidden Features: Rotation capability – 330 degrees. You can also adjust the height by adding or removing counterweights. Design Consigned Stylist: Ideal for spaces where you may need to decentralise the overhead light source. The diffuser shade emits upward light as well. 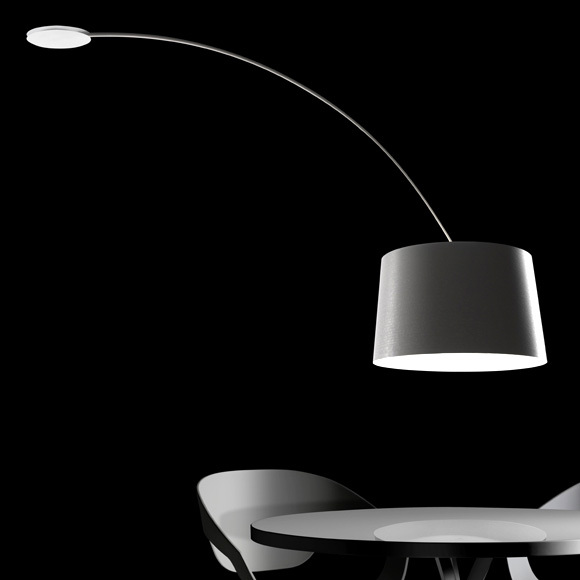 Design Consigned Collector: Authentic original, made in Italy by Foscarini. Stamp or Mark of authenticity: Still in Foscarini box. DC Insider: An unsuitable purchase.